Alphedia is the Soul Name of Fiona Murray, a lovely person I had the pleasure of connecting with recently. She founded the website Elemental Beings, where she is a channel for the angelic, unicorn, elemental and crystal realms. 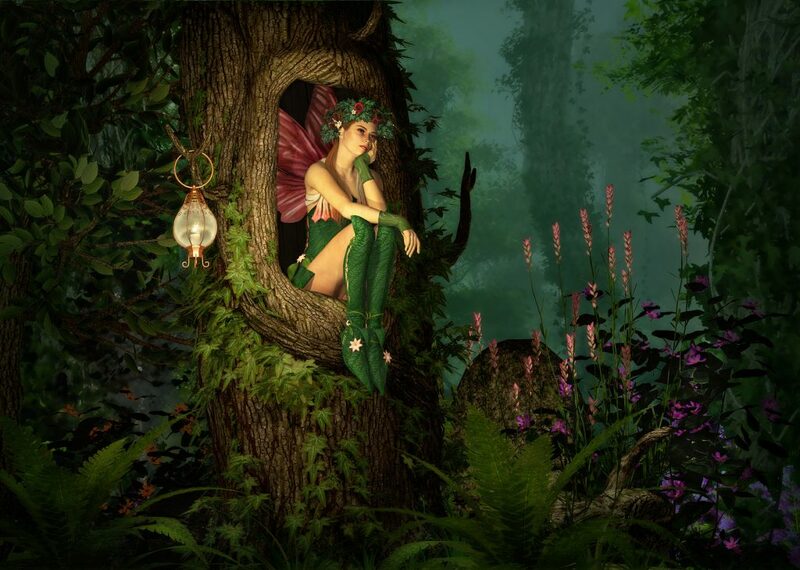 Based in Scotland, Alphedia’s first book Messages from Nature’s Guardians discusses the many fairies and elementals she has come across since her spiritual journey began. I had many questions about elemental beings, most specifically about fairies. Alyce: You were asked by angels and elementals to raise the knowledge of nature guardians throughout the world. How did your spiritual path begin? Alphedia: I cover this in my first book, Messages from Nature’s Guardians. My background is as an environmental scientist. I was working in the Scottish Parliament as an environmental political adviser and researcher and going down the route of politics with my environmental work. When I was 23, I was struck down with an illness, akin to meningitis. It was misdiagnosed by the medical profession and I was left bedridden, unable to move for a year and a half. I was unable to tolerate artificial light for three years. I then had a near-death experience and came out of body. I heard a booming male voice say to me, “You know, it’s a choice whether to live or to die.” Obviously, I chose to live but as soon as I made that decision, I was straight back in my body and my mum slapped my face and managed to bring me out of the coma. Then I was still left unable to move for many months. The NHS, which is the healthcare system we have over here said, “There’s actually nothing we can do for her.” But my parents managed to find a private neurophysiologist who treated me with a machine called cell care therapy which blasts ions at you and allows your body to boost its own immune system. This basically allowed me to fight off any illness (and perhaps could revolutionise the whole world for medical healthcare). Because it was not made by a pharmaceutical it would be what you’d deem “alternative”. And so, my experience with fairies started. First of all, I started to communicate with the angels and it was my doctor, who told me to read a book by Doreen Virtue, A Lightworker’s Way. I had to learn to read again, so I was looking for books that were going interest me. Doreen spoke about angels and fairies – I just found I could easily hear them, so I realised then that everybody can (hear angels and fairies) if they’re into this kind of spirituality. I was learning how to walk outside again and how to deal with noise and wind. The first time I was back outside in three years I discovered that I was now aware of these “energies” on plants and flowers. I said to myself, “My goodness – there are fairies there!” And that’s how it all started. I was told by the angels I wasn’t going to back to working in politics – I was going to write a book about fairies and elementals and teach people how to communicate with these nature beings, as well as beings in other realms. Alyce: Does every plant has its own individual elemental? I have heard that every little elemental acts as a guardian of the plant – sort of like the “spirit” of the plant. I have also heard that the elemental can’t stray too far from its plant. Is this true? That’s true because there are elementals and then there are nature spirits. Nature spirits are creatures like mermaids and unicorns. The key thing is with elementals is that they are tied to their element. The element (air, fire, water, earth) couldn’t exist without the elemental guarding it. There are definite layers to the elemental realm – or the Devic kingdom as it’s sometimes known. Elementals (for example) could be a fairy who’s the guarding elemental of a plant. 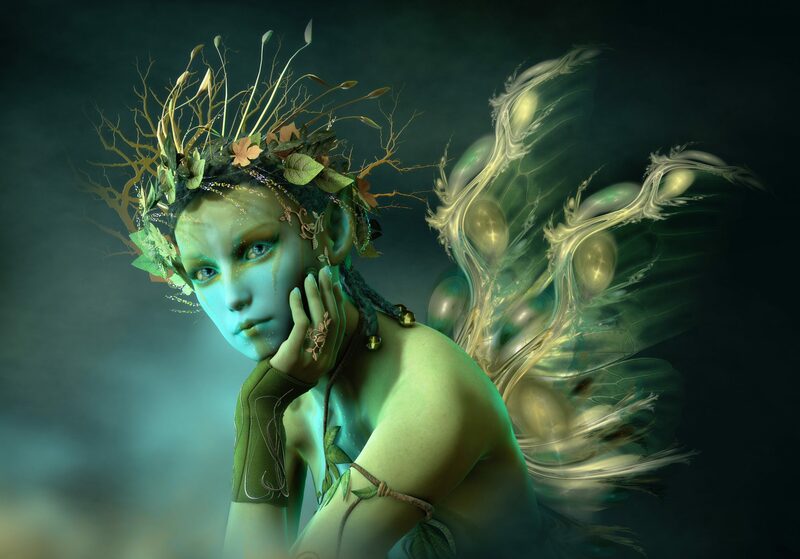 The fairy could also choose to detach from its plant and become a human’s guardian fairy. There are so many different types of fairies. There are the elemental fairies and ones that are known in Scotland as the Sí – the magical fairies that live in royal courts. You get these beings in Ireland as well, living in fairy wreaths. These are the beings that are traditionally written about in Scottish and Irish folklore, but there’s many different types of them. The Devic realm is more complex than most people think. But it’s true that fairies are tied to their element. Alyce: Will devic and elemental beings ever potentially evolve into human beings? Alphedia: Yes, many do incarnate. In fact, I myself am a part-incarnate fairy. There are many incarnate fairies and elementals around and I can see them. Once you know what an incarnate elemental looks like, you can spot them. Canadian expert Tanis Hallowell wrote a book about this after she went to Ireland and stayed in a cottage for a month and saw all these leprechauns. She writes that the leprechauns were amazed that she could see them – they told her that the only other person who could see them “lived here long ago.” That person turned out to be Rudolf Steiner who had stayed in the same house, a piece of information that Tanis hadn’t known. The leprechaun in Tanis’ book explains why some elementals have chosen to step over into the human realm. The reason they gave was to raise awareness of environmental concerns and to raise consciousness of humans and many children. Alyce: Can you tell me about children today – how intuitive are they? Alphedia: These new children coming to the planet are called the Petal Children – my son’s one of them. He was born on the first of January 2012. These are fairy children who’ve not been incarnate on planet Earth before. They have come as little eco-warriors to help raise the consciousness of humanity to be nicer to animals and to protect the environment. You can see it in these children even at the age of one. My son is like a typical fairy with wee pointy ears – running about, all over the place, quite cheeky and smiley and talkative! Once you start to notice you can see which humans are incarnate elementals. Alyce: Are children and animals more attuned to the elemental world than some adults? Alphedia: The difference is that they remember it. When we are birthed onto the planet as a human, we don’t remember life on the other side. We don’t remember our past lives. We’ve been birthed through different veils and these veils have become much thinner. That’s what the 2012 shift was all about. Now, as our consciousness rises and we move into fifth dimensional reality, the veils are becoming thinner. These children (being born now) are a lot more psychic. There is also a higher incidence of autism which medical science doesn’t understand at all. Most autistic children are just “out of body”. You can bring them back into body, it’s just the reaction their brains have taken. There will become a time again when we can see elementals as we raise our energy vibration. So a lot of the work I do for people is removing their collective consciousness conditioning. Do you think that maybe hundreds of years ago, maybe even in medieval times that perhaps people could see elementals more than they can now? Definitely. Because they were out in nature. They lived in the natural world. Our main problem here in the Western world is most of us are stuck on computers and live in a concrete jungle. I mean I live out in the countryside, but also, the earth energy was much higher because humans weren’t trashing it. The ley lines were still intact, and they’re so important – The earth energy lines because the elementals gather around them, and also, the key for working with elementals is having open heart chakras. If we’re not out in nature, our heart chakras are not getting the nourishment that they require, and we’re not communicating with the land, we’re so disconnected from it. In the past, people had to farm the land, and to grow the crops themselves. They picked their own apples. You were interacting with them. We were a pagan society and it’s like in science, they talk about paradigm shifts. The old paradigm existed, which was pagan cultures and then Christianity came along. They tried to bring in their tradition to working with the old tradition and then they turned into demonising it. So that is classic paradigm shift pattern. Then people became scared to leave milk out for the fairies! In the past, the last crop field wouldn’t be cut because they’d leave that for the Little Folk or the Gentry, as they would call them! I went to Ireland on my honeymoon and they still believe. If you go out into the rural areas in Ireland, they still believe in fairies! s just pretty much non-existent, but Scotland and Ireland do because the folklore is so rich, everybody had an awareness, whereas here in Scotland, not everybody has an awareness now. Do magical creatures and realms exist on the astral plane or how exactly does it work? Imagination is part of your creativity and that is the thing that elementals talk a lot about because when you’re actually daydreaming, you’re allowing your mind to be expansive and you can become aware of all these realms. They do exist in the other realms and often, if people are having daydreams or dreams about them or if you’ve even just sitting, imagining them, you may have got many guides around about you. They’ll be dropping these visions into your head to remind you of what your divine life path is. We’ve come in with a divine life path, but we’re birthed through the veils of illusion so we forget of what our divine life path is. We’ve got all these guides around about us – Angels, fairies, spirit guides, ascended masters, whoever, trying to help us get on our path and to remind us about our path, but ‘cause we are free willed, they’re not allowed to interfere unless we ask them to help us. So once you open the door up to them, then they’ll all come through. And I tend to find that most of the things that sort of exist within fantasy fiction are reality actually because the idea of them has come from somewhere. Can elemental beings ever harm us? Are they always good? Have you ever heard any instances of a bad interaction between a human and an elemental? Well, of course, in folklore, there is lots of tales, but I’m always saying to people that there’s no such thing as good and bad. That’s a judgment. And as we’re moving into the fifth dimension, we’re moving out of place of judgment because judgment comes from the ego self. It doesn’t come from the heart. Every experience you have in life, there is a reason that you’re having that experience. There are some elementals who don’t want to interact with humans. I was actually giving a talk at the Glasgow Body and Soul Fair at the weekend and somebody asked me the same question. And in Scotland, the fairies are split into two camps. One’s known as the Seelie Court and one’s known as the Unseelie Court, and the Seelie Court fairies are totally happy to communicate with us. The Unseelie Court fairies don’t want to have any interaction to do with humans. They’re just really fed up with how we’ve trashed the environment. But the elementals mirror back to us “our behaviour” and “our state of being”. All the elementals have been doing is showing them their shadow side. They can’t harm you because they’re not in the physical realm, but believe me, I have come across beings, off-world beings, who’ve caused me a lot of psychic attack. But that’s only because there’s been that fear vibration or they’ve been using aspects of myself. The only way they have power is through using aspects of yourself. For example, your fear body, so the more you work on your spiritual growth, the more you work on clearing your pain body, letting go of emotions such as anger, and hatred, greed, fear, guilt – All these emotions that no longer serve us as we move into fifth dimension. The more you work on your body, the more positive experiences you’ll have. If you are communicating with them for pure reasons and coming from a place of love, then that’s all you will attract back. If people would like to learn more about elementals, no matter where they are in the world, you can kind of do a consultation. Is that correct? I run workshops. I record it so people all over in the world take place in my workshops. A lot of customers are all around the world who want to work with dragons and I do lots of different things with them. I told my partner I was speaking with you today. And he, of course, wanted to know about gnomes. You’ve spoken a little bit about them. But are gnomes real? Do they exist? Oh. Yes. Gnomes are hilarious. I wrote about them. Gnomes are the guardians of ley lines, so you’ll find gnomes where there’s any energy lines. Gnomes are great elementals to work with! I don’t know about the elementals in Australia, but I would imagine that you’ve a lot of ley lines going through, so there’ll be gnomes in Australia as well you can go and communicate with. Men tend to like gnomes. That’s quite funny!